This system was set up in April 2002, it is owned and operated by Robert H. McNaught (prev. Siding Spring Observatory) to survey the small to intermediate particles in the solar system by their interaction with Earths atmosphere. Several surveys have scanned the sky visible from the northern hemisphere but this is the only one looking at the southern skies. This system utilises low light surveillance cameras looking at the same patch of sky from separate locations. As of 2008, there are 9 cameras operating from 4 observing stations. 3 cameras from Coonabarabran, 3 from Tamworth, 2 from Mudgee, and 1 from Narrabri. On the cameras page is a chart showing the camera locations and the overlap of all the fields of view. The program was initially being partly sponsored with a grant from the Edward Corbould Research Fund through the Astronomical Association of Queensland (AAQ). This grant had helped with the initial purchase of several pieces of equipment, CCTV lenses and Matrox video cards. All costs have since been born by Rob McNaught throughout the project. Each camera is fitted with a wide field lens, then connected to a Pentium III PC via a Matrox video capture card. 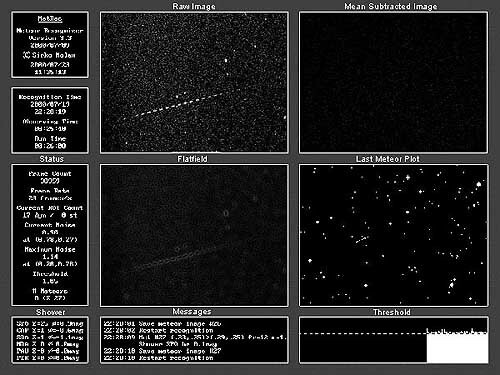 Meteor detection software ( MetRec ) was written and developed by Sirko Molau (Germany) for meteor watchers around the world. It runs constantly all night and calculates the angular velocity, brightness and direction of each meteor in real time, then saves images and data files to the computer hard drive. It also shows if the meteor is from a known meteor shower. With each event generating an average of 500kb of data, it quickly adds up, so is archived to CD-ROM and DVD regularly. Custom software is used to analyse the data sets looking for statistical relationships. One new southern meteor stream is already indicated in the data collected so far.